Equity is very relevant when discussing, and debating, the growing chasm between the extremely wealthy at the top of society, and the poverty-stricken at the bottom. It also is very relevant to the shrinking middle class, an essential segment of society for creating and maintaining a vibrant, functional economy. Equity is particularly relevant when considering all of the political promises to provide long-term financial security, as expected with promising elderly citizens Social Security benefits in retirement. In such a case, government promises retirees a share of future energy production, a worthy pledge only if the economic system continues to function well. Otherwise, all bets are off if the economy suffers a major collapse, or environmental destruction becomes catastrophic, or marginalized citizens decide to revolt. We’re facing two big problems that few people recognize: 1) the need to assure an amount of per-capita net energy to keep the economy from collapsing; and 2) the reality that entropy affects every aspect of life, which results in rising debt, increased pollution and environmental damage, [deteriorating infrastructure] and accelerating complexity, all of which tend to bring down the system, even when energy supplies seem plentiful. Tverberg explains that, if the economy is to grow, it will be necessary for common laborers to have good-paying jobs, along with rising pay (that keeps pace with inflation). Although robots may be very efficient at producing goods and services, they cannot recycle the system’s earnings. Only human wage earners can accomplish this function. In sum, the many entropy issues involved are slowing growth. Some examples: people in China cannot stand any more pollution; too many laborers in developed countries are being marginalized by globalization and by competition; and increasing numbers of intelligent machines are replacing much of human labor. In addition, commodity prices need to rise high enough to encourage production. If we didn’t have such a huge amount of individual, national, and international debt, none of these issues would present insurmountable challenges. Tverberg summarizes her article with a cautious warning: “If these problems are not fixed, the whole system will collapse, even though there seems to be a surplus of energy products”. > Our Finite World: Our Economic Growth System Is Reaching Limits In A Strange Way (Gail Tverberg). 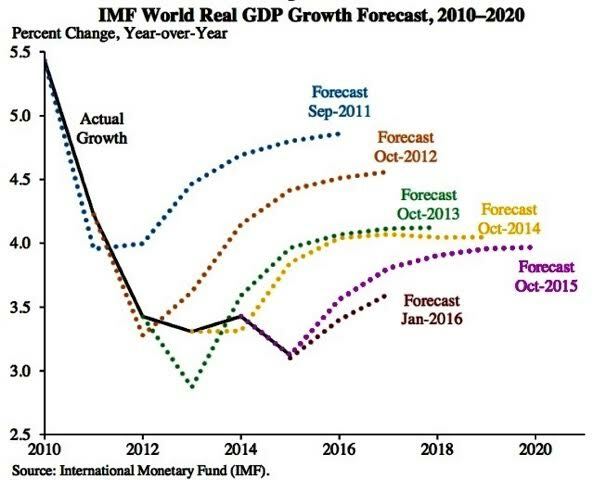 Economic growth never seems to be as high International Monetary Fund forecasts would like it to be, as the chart below illustrates. We are experiencing a world economy that seems to be reaching limits, but the symptoms are not what peak oil groups warned about. Instead of high prices and lack of supply, we are facing indirect problems brought on by our high consumption of energy products. In my view, we have a double pump problem (rising energy consumption and entropy production). We don’t just extract fossil fuels. Instead, whether we intend to or not, we get other big unwanted “co-products” as well: rising debt, rising pollution, and a more complex economy. As energy products are burned, we also have an increasing pile of debt, increasing pollution (that our CO2 sinks become less and less able to handle), and increasing wealth disparity. > Atomic Scientist Bulletin: Family Planning: The Quick Carbon Payoff (Alisha Graves). In so many realms of national policy, the interests of the entire population must be balanced against the rights of individuals. And so it would seem to be with climate mitigation and family planning—how can nations reduce their carbon dioxide emissions if nothing prevents individuals from having as many babies as they want? But the truth lies deeper than that. Because so many individuals have more babies than they want, providing them the means to plan their families can help nations contain their total carbon emissions. > Weathering the Storm: Climate Change: Election Year Myths Debunked (R. Michael Conley). The climate change debate ought to focus on the threat it poses and the science behind it; instead, it is being framed around many of the aforementioned collateral issues. That said, the myths behind these issues need to be exposed and debunked. Let the voter beware! > The Guardian: Surge In Renewable Energy Stalls World Greenhouse Gas Emissions (John Vidal). Falling coal use in China and the US and a worldwide shift towards renewable energy have kept greenhouse gas emissions level for a second year running, one of the world’s leading energy analysts has said. Preliminary data for 2015 from the International Energy Agency (IEA) showed that carbon dioxide emissions from the energy sector have leveled off at 32.1bn tons even as the global economy grew over 3%. Electricity generated by renewable sources played a critical role, having accounted for around 90% of new electricity generation in 2015. Wind power produced more than half of all new electricity generation, said the IEA. > Ensia: To Build A Sustainable World, Academics Need To Tear Down The Ivory Tower (Anthony D. Barnosky, Elizabeth A. Hadly). Until recently, Earth was so big compared with humanity’s impacts that its resources seemed limitless. But thanks to rapid growth in both human population and per capita consumption, we are now on the edge of irrevocable damage to our planetary life support systems. If we want to avoid locking in long-lasting impacts, it is imperative that we quickly solve six intertwined problems: population growth and overconsumption, climate change, pollution, ecosystem destruction, disease spillovers and extinction. To implement knowledge that arises from basic research, academics must establish dialogues and collaborations that transcend narrow academic specialties and bridge between academia, industry, the policy community and society in general. > The Wall Street Examiner: What Killed The Middle Class? (Charles Hugh Smith, Gordon T. Long). If the four structural trends highlighted below don’t reverse, the middle class is heading for extinction. They are: 1) declining productivity, which means the pie of real wealth is no longer expanding; 2) all the gains in the economy have flowed to corporations and the top 10% of financiers, managers and technocrats; 3) the middle class doesn’t own the “right” assets to benefit from systemic financialization and financial speculation; and 4) soaring costs of big-ticket expenses such as higher education and healthcare. > BBC: Why Are People So Incredibly Gullible? (David Robson). Why do so many false beliefs persist in the face of hard evidence? And why do attempts to deny them only add grist to the rumour mill? It’s not a question of intelligence – even Nobel Prize winners have fallen for some bizarre and baseless theories. But a series of recent psychological advances may offer some answers, showing how easy it is to construct a rumor that bypasses the brain’s deception filters. One, somewhat humbling, explanation is that we are all “cognitive misers” – to save time and energy, our brains use intuition rather than analysis. Then there’s the “cognitive fluency” of a statement – essentially, whether it tells a good, coherent story that is simple to imagine. It’s always worth asking whether you have thought carefully about the things you are reading and hearing. Or are you just being a cognitive miser, persuaded by biased feelings rather than facts? > New York Times: Scientists Warn Of Perilous Climate Shift Within Decades, Not Centuries (Justin Gillis). “We’re in danger of handing young people a situation that’s out of their control,” said James E. Hansen, the retired NASA climate scientist who led the new research. The findings were released Tuesday morning by a European science journal, Atmospheric Chemistry and Physics. Virtually all climate scientists agree with Dr. Hansen and his co-authors that society is not moving fast enough to reduce emissions of greenhouse gases, posing grave risks. The basic claim of the paper is that by burning fossil fuels at a prodigious pace and pouring heat-trapping gases into the atmosphere, humanity is about to provoke an abrupt climate shift. > E&E Publishing: CLIMATE: Top Scientists Find It Hard To Make Public See Risks (Amanda Reilly). Officials and scientists who write and review the nation’s chief climate analysis say they are struggling to get across the risks of climate change to policymakers and the public. Finding ways to portray risks in timescales and language that people understand remains a challenge, they said this week at a two-day meeting of the National Academies of Sciences, Engineering and Medicine. And it’s as difficult to explain risks on a localized level, as it is to show, without facing accusations of fear mongering, that climate change is an existential threat to the human race, they added. > Star Tribune: Plastic Bag Ban Wins Approval Of Mpls. Council Committee (Erin Golden). If approved, the ban would take effect in April 2017 and cover all types of businesses, with a few exceptions. It would exempt several types of plastic bags, including those used to wrap produce, flowers, baked goods, takeout foods, newspapers and dry-cleaning or laundry. It would require businesses to charge customers a 5-cent fee for paper bags, though customers receiving public assistance to buy food would not be required to pay the fee. > Star Tribune: First Midwest Cellulosic Ethanol Plant Is Producing Tank-Car Loads Of Fuel (David Shaffer). Poet Inc., the nation’s first commercial-scale producer of cellulosic ethanol, is shipping the fuel from its plant in Emmetsburg, Iowa, and could hit full production by the end of 2016, company founder and Chief Executive Jeff Broin said Tuesday. Broin said the plant, completed in 2014 with Dutch partner Royal DSM, has shipped tank-car loads of fuel in recent months, though he declined to give the quantity. The $275 million plant is the first of three large ethanol plants in the Midwest designed to used corn stalks and cobs, rather than corn kernels, to produce the fuel. > Ensia: The Farm That Grows Climate Solutions (Eric Toensmeier). This article is adapted from The Carbon Farming Solution: A Global Toolkit of Perennial Crops and Regenerative Agriculture Practices for Climate Change Mitigation and Food Security by Eric Toensmeier (2016). The book introduces the concept of carbon farming, explains how it can help mitigate climate change, and explores strategies for adoption around the world. The term carbon farming is used to describe a suite of crops and agricultural practices that sequester carbon in the soil and perennial biomass. If widely implemented, these practices have the capacity to sequester hundreds of billions of tons of carbon from the atmosphere in the coming decades. Unlike high-tech geoengineering strategies, these practices can also feed people, build more fertile soils and contribute to ecosystem health. > NPR: A ‘Forgotten Disease’ Is Suddenly Causing New Worries (Nurith Aizenman). The world is in danger of running out of vaccines for a deadly disease: yellow fever. A major outbreak in the African nation of Angola has already depleted the stockpile that world health officials had set aside for emergencies. It’s unclear whether new vaccines can be made in time — even as officials worry that the epidemic could spread through Asia and beyond. “The bottom line is that this is another example of an emerging infection that poses a threat that may not be limited to Africa,” says Dr. Tom Frieden, who heads the U.S. Centers for Disease Control and Prevention. > BBC News: UN: 2015 Record Year For Global Renewables Investment (Mark Kinvar). A study by the Frankfurt School-Unep Collaborating Centre for Climate and Sustainable Energy Finance and Bloomberg New Energy Finance shows that Global investment in renewable energy hit a record US$285.9bn in 2015, beating the previous high of $278.5bn set in 2011. The 10th Global Trends in Renewable Energy Investment also showed that investment in developing nations exceeded that in developed countries. In another first, more new renewables capacity than fossil-fuel generation came online during 2015. But it warned that much more had to be done to avoid dangerous climate change. > Midwest Energy News: Report Forecasts Continued Clean Energy Job Growth In Minnesota (Frank Jossi). Minnesota will add 2,300 jobs in the clean energy industry this year, according to a report released March 22nd by the Clean Energy Trust. Of the state’s 54,000 clean energy jobs, 87 percent can be found in the energy efficiency sector. This employment includes tasks such as installing high-efficiency lighting and providing HVAC services and manufacturing Energy Star appliances. > The Wall Street Journal: Solar-Panel Installers Face Clouded Future (Cassandra Sweet). Many U.S. states are considering dialing back solar-power incentives amid growing pressure from local electric utilities, potentially dealing a blow to the companies that install home solar systems around the country. More than 900,000 homes across the U.S. are equipped with solar panels, with most of those homeowners able to sell any excess electricity their houses generate back to the utility, helping reduce the cost of home solar panels by up to 30%. But the price solar customers get paid for that extra renewable power through so-called net metering is starting to fall, as several states, including Nevada and Hawaii, have slashed their solar subsidies. > Star Tribune: Minneapolis Takes Fresh Look At Plastic Bag Ban (Erin Golden). A proposal being considered by the Minneapolis City Council would ban businesses from packing customers’ purchases in plastic bags and require them to charge a 5-cent fee for paper, compostable or reusable bags. Its aim: get residents to cut back on their use of plastic bags, put less waste in landfills and help Minneapolis get closer to being a “zero waste” city where nearly everything tossed out is recycled. The idea of banning or taxing bags has picked up support from several local environmental groups and businesses that have made sustainability a key part of their operations. But it is also prompting concern from other business owners and has attracted the attention of out-of-state lobbyists, who have spent millions trying to defeat similar proposals in other states. > Yes! Magazine: Forget Nutraloaf—Prisoners Are Growing Their Own Food (Marcus Harrison Green). The substandard quality of food at some correctional facilities has led to protests and hunger strikes, as in summer 2013 when nearly 30,000 California state prisoners refused food to demand, among other things, fresher and more nutritious meals. But some states, along with correctional authorities and prison activists, are discovering the value of feeding prisoners nutrient-rich food grown with their own hands. Prison vegetable gardens, where inmates plant and harvest fresh produce to feed the larger prison population, are on the rise in correctional facilities from New York to Oregon. > Quartz: The Swift Rise Of Cage-Free Eggs Reveals Americans Changing View Of The Moral Universe (Paul Shapiro). Nearly every major egg buyer in our nation—from McDonald’s and Denny’s to IHOP and Costco—has announced policies to go 100% cage-free with their eggs. Voters and state lawmakers are also taking action. Egg Industry magazine itself has said that a shift to cage-free housing “may be the most significant development of 2016 for US egg producers.” That’s a big change in a relatively short span of time. And the evolution of political and public opinion over cage-free eggs offers a lesson in the power of social media, video streaming and other new technologies to affect change in animal welfare. > Transit for Livable Communities: Transportation Forward Day At The State Capitol, Mon., April 4, 12:00 – 5:00 p.m., Confirm you’ll be there; Contact: Andrea Kiepe (651-789-1406 or andreak@tlcminnesota.org). > Conservation Minnesota: Community Solar Garden Workshop, Tues., April 5, 7:30 p.m., Falcon Heights City Hall (2077 Larpenteur Avenue West). Free. Contact: Julie Drennen (Julie@conservationminnesota-email.org); 612-767-1569. > Fresh Energy: Consumer Friendly Community Solar Pledge, This website provides a guide for consumers as they consider subscribing to a community solar garden.